Includes Fenugreek Seed Extract, Tribulus Terrestris, Ginseng, Coryceps, Sinensis, Muira Puama, Chrysin, and our proprietary Vitamin Support Matrix. Non-Stimulating. Safe and Effective Way to Amplify Natural Testosterone Production in Men. 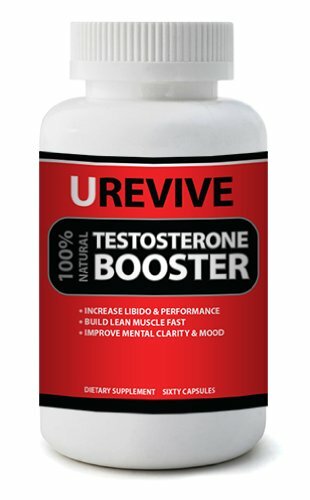 Urevive All Natural Testosterone Booster - Zero Filler, Zero Binders, Zero Artificial Ingredients. Boost libido, build muscle and melt fat, and enhance mental clarity and mood. FULL-Strength 608MG Per CAPSULE. Full 30-Day Supply. 60 vegi-caps / bottle. Recommended Dosage: 2 caps / day.